An artist's illustration of DARPA's Experimental Spaceplane 1, XS-1, for the U.S. military. The robotic space plane is expected to launch satellites and payloads into orbit cheaply and efficiently. DARPA is seeking designs from three different teams of aerospace companies. The U.S. military is moving ahead in its plan to develop a robotic space plane capable of launching payloads to orbit cheaply and efficiently. 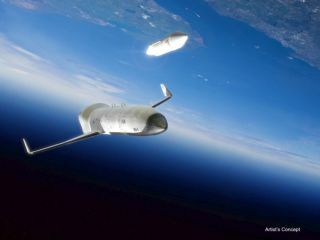 The Defense Advanced Research Projects Agency (DARPA) has awarded initial design contracts for its Experimental Spaceplane project, known as XS-1, to three different companies: Boeing, Masten Space Systems and Northrop Grumman, DARPA officials announced today (July 15). A rocket upper stage carrying a satellite payload launches into orbit in this artist's concept of the U.S. military's XS-1 Experimental Spaceplane, a project overseen by the Defense Advanced Research Projects Agency. All three awardees are partnering with other aerospace firms during this stage of the XS-1 space plane project, which is known as Phase 1. Boeing is teaming up with Blue Origin, Masten is working with XCOR Aerospace and Northrop Grumman is working with the company Virgin Galactic, which is building its own private suborbital spaceliner for space tourist trips, DARPA officials said. Boeing already provides one robotic space plane to the U.S. military; the company builds a vehicle called the X-37B for the Air Force. One X-37B spacecraft has been circling Earth on a secret military mission since December 2012. Boeing representatives said that the company's preliminary XS-1 contract is worth $4 million. DARPA hopes the XS-1 program, which was first announced last September, can help make spaceflight much more affordable and routine. Officials want the unmanned vehicle to launch 3,000- to 5,000-lb. (1,361 to 2,268 kilograms) payloads to orbit for less than $5 million per flight, and to be able to blast off at least 10 times in a 10-day span. The vehicle will likely employ a reusable first stage and one or more expendable upper stages, DARPA officials said. The first stage will fly to suborbital space at hypersonic speeds, and then return to Earth to be used again; the upper stage will separate and deploy the payload into low-Earth orbit. This concept art depicts one possible design for the U.S. Military's XS-1 Experimental Spaceplane by Boeing, which was tapped by DARPA as one of three aerospace teams to draw up designs for the robotic spacecraft. During Phase 1, each of the awardees will develop a demonstration vehicle and come up with a plan to build and flight-test XS-1 spacecraft systems, DARPA officials said. The agency is expected to hold a Phase 2 competition next year, to assess the Phase 1 work and see who makes it to the flight-test stage. DARPA only has enough money for one contractor in the end, but officials are holding out some hope that more than one vehicle could perform flight tests. "I would love for somebody from NASA or the Air Force out there to step forward and say, 'Hey, there's obviously more than one of these things that we want to go flight-test; let's fly more than one," Sponable said in February during a presentation with NASA's Future In-Space Operations (FISO) working group. Current plans call for flight tests to begin in 2017 and the first orbital mission to take place in 2018, Sponable said during the FISO talk.